When Iranian president Hassan Rouhani was elected in 2013, the first head of state to meet with him was from the Gulf Cooperation Council (GCC). Oman’s Sultan Qaboos saw a new leader in Rouhani, one whose policies would undoubtedly diverge from his hardline predecessor, Mahmoud Ahmadinejad. For many Iranians, Rouhani symbolized progress and reform in Iran, a view that even GCC leaders like Qaboos shared. Mending relations with Iran’s Gulf neighbors continues to be a top priority for Rouhani, now in his second term as president. As Iran’s designated enforcer of religious authority, Khamenei wields the greatest political and military power in the country. Although Rouhani may rank lower in the political hierarchy than the Supreme Leader, his powers should not be underestimated. Khamenei has granted Rouhani surprising flexibility and muscle when it comes to developing foreign policy, as evidenced by the Joint Comprehensive Plan of Action (JCPOA), frequently referred to as the Iranian Nuclear Deal, reached with the international community despite the Supreme Leader’s skepticism. Even Khamenei could deny the potential benefits of a deal that would lift the country from its precarious economic state. Improving relations with the Arab Gulf states would do the same. A myriad of other factors, however, will hinder Rouhani’s efforts to ameliorate Tehran’s relations with the GCC states. Among these include the civil wars and political crises in Syria, Iraq, Yemen and Bahrain, in which Iran finds itself on the opposite side from Saudi Arabia and other Arab Gulf monarchies. The simmering Qatar crisis will further complicate the prospects for improved relations, given that the diplomatic row threatens to further destabilize the region by drawing new fault lines. That said, understanding Rouhani’s foreign policy goals for the Gulf will shed light on whether Iran will respond to confrontations from the Gulf with an iron first or an extended hand. Most Arab Gulf states, and especially the GCC’s powerhouse, Saudi Arabia, have been wary of Iran’s regional ambitions ever since the establishment of the Pahlavi dynasty in 1925. Following the U.K.’s exit from the Middle East in the early 1970s, Mohammad Reza Shah sought to fill the power vacuum and to assume the role of the region’s policeman. The Arab Gulf sheikdoms felt threatened by the Shah’s unprecedented military spending during the last years of his leadership, which increased twelvefold from USD 67 million in 1953 to USD 844 million in 1970. Iranian-Arab Gulf relations only continued to sour under the Shah. In addition to being the first Middle Eastern state to recognize Israel, he also traded oil with the Jewish state. Instead of participating in both the 1967 and 1973 oil embargoes, the Shah profited from them. Although he succumbed to international pressure to abandon his quest to annex Bahrain, he seized the former British protectorate islands, Abu Musa and Greater and Lesser Tunbs, in 1971, despite the UAE’s claim to them. The islands remain on ongoing, unresolved territorial dispute between Tehran and Abu Dhabi, hampering Rouhani’s efforts to improve Iran’s relations with the Emirates. Relations grew worse with the creation of the Islamic Republic. The first supreme leader, Ayatollah Ruhollah Khomeini, sought to establish a revolutionary and Islamic government. His fiery speeches called for oppressed people around the world to resist their oppressors, just as Iranians had done against the Shah. Touting himself as the leader of the third world, he inspired a new generation of protesters—including portions of the Shi’ite populations of Bahrain, Kuwait, and eastern Saudi Arabia. The GCC states quickly perceived the Islamic Republic to be a far greater threat than the Shah had been; exporting Khomeini’s revolution was a cornerstone of the Tehran regime’s foreign policy. Since 1979, Tehran has sponsored, and received the loyalty of, various Shi’ite militias, movements, and political parties in Bahrain, Lebanon, Iraq, Pakistan, Syria, and Yemen. The U.S. occupation of Iraq in 2003 was a major strategic win for Iran, as the fall of the Islamic Republic’s main rival, Saddam Hussein, tipped the balance of regional power in Tehran’s favor. Although the Shah struggled to prove Iran’s regional relevancy, there was no doubt of it under the new Islamic Republic. Jordan’s King Abdullah II described Iran’s expanded influence as the establishment of a “Shi’ite crescent”—much of which would envelop parts of the Gulf. Iran’s Mahmoud Ahmadinejad. Photo by Daniella Zalcman, Wikipedia Commons. Iranian-Arab Gulf relations vacillated during Mahmoud Ahmadinejad’s presidency. 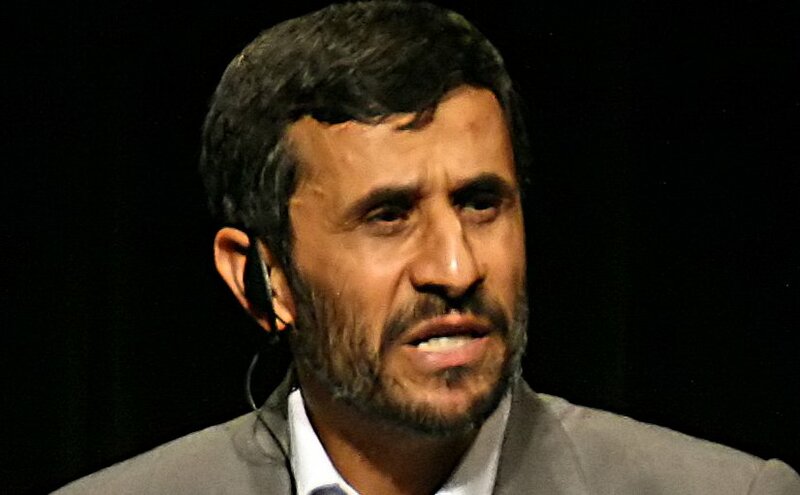 Ahmadinejad, a hardliner and fervent supporter of the Islamic political system, was elected in 2005, in what was a decisive victory against the leftist reformists. Ahmadinejad wanted to elevate Iran’s role in the Middle East, and one strategy was by strengthening relations with the GCC. Under his reformist predecessor, Khatami, relations with the Arab Gulf states had been relatively calm. Khatami’s efforts to improve Iran’s international relations by creating a Dialogue Among Civilizations extended to the Gulf, although they failed to materialize. Ahmadinejad picked up on Khatami’s efforts, albeit with little success. He proposed an Iran-Gulf agency that would address regional issues as well as an economic cooperation council. GCC leaders invited him to their two-day summit in Doha in 2007, although they were reluctant to accept any of his proposals for greater cooperation. Despite Ahmadinejad’s extensive efforts to build bridges across the Gulf, most GCC leaders still saw Iran as a grave threat. He did little to reassure them about his expansionist foreign policy agenda that included increasing military aid to Shi’ite groups abroad, particularly in Iraq, which had just elected a majority Shi’ite, pro-Iran government, and in Lebanon, where Iran’s main proxy, Hezbollah, was also becoming increasingly powerful. Although Ahmadinejad was quick to criticize the Arab Gulf governments’ treatment of their countries’ Shi’ite communities, there is little evidence to suggest that he directly funded any Shi’ite movements there. The tipping point in Tehran-GCC relations was Ahmadinejad’s acceleration of uranium enrichment for Iran’s nuclear program. Although Iran’s relations with the various Arab Gulf states varied, they all felt threatened by the prospect of Iran obtaining a nuclear weapon. Ahmadinejad instrumentalized Iran’s nuclear program as a political tool to spur nationalism. Under his presidency, the program symbolized resistance against the West. Arabs throughout the region admired him for his courage to stand up against the U.S. and for his disdain of Israel. The Arab Gulf states’ leaders, meanwhile, and particularly Saudi Arabia, had softened their rhetoric toward Israel because of its close relations with Washington. Iran led the charge against Israel, and touted itself as the protectorate of the Palestinians by funding Hamas and other groups which GCC states consider terrorist organizations. Ahmadinejad’s foreign policy threatened to derail Khatami’s diplomatic efforts of integration into the international community. Rouhani’s victory in the 2013 presidential elections, however, marked a turning point for Iranian foreign policy. Rouhani ran on a platform that addressed the people’s economic grievances. Like Khatami, Rouhani believed that Iran’s economic woes could be resolved by improving relations with the West, which was only possible if Iran made concessions on the nuclear file. In 2015, Rouhani was able to strike a nuclear accord with the international community. Years of negotiations culminated in the 2015 Joint Comprehensive Plan of Action (JCPOA) agreement, which saw the Islamic Republic dramatically curb its uranium enrichment in exchange for sanctions relief. Within months of the deal, Iranian embassies were resurrected across Europe and relations with the U.S. were the strongest they had been since 1979. Rouhani’s detente with the West set new conditions by which Iran could begin creating partnerships with the Arab Gulf monarchies. Known as the “Diplomatic Sheikh”, Rouhani made immense strides toward smoothing relations with the GCC during his first term. He began his presidency with a “charm offensive” aimed at improving Iran’s international relations amid the nuclear talks. At the forefront of the campaign were the Arab Gulf states. The most notable achievement of Rouhani’s his charm offensive was improved relations with Qatar, for which would pay the price during his second term. In 2014, Rouhani launched the Iran-Qatar Joint Political Committee, tasked with finding a political solution for Syria. Relations between Doha and Tehran continued to improve, largely due to common economic interests. That same year, Iran requested Qatar’s help in extracting oil from its side of South Pars, the world’s largest oil field, which the two countries share. Doha’s relations with the Islamic Republic have continued to be amicable, despite political disagreements over Syria. Qatar has been less inclined to participate in the sectarian rhetoric espoused by Saudi Arabia against Iran, and instead has advocated rapprochement between the two countries. The Sultanate of Oman also believes in promoting regional cooperation. Muscat and Tehran have strong historical ties that remained intact even following the revolution. Oman’s efforts to advance peace have been grossly underrated. Oman has served as a backchannel during several conflicts with Iran, including as a liaison between Iran and the U.S. during the nuclear talks and also during the first Gulf War when it mediated secret ceasefire talks. Oman is motivated by economic interests, because it participates in joint-control over the Strait of Hormuz, the region’s only sea passage, and relies on Iran for much of its oil. Although Oman, as a member of the GCC, is closely aligned with Saudi Arabia, it is still wary of the Saudis’ fiery brand of Sunni Islam, Wahhabism. Iran under Rouhani has made immense strides in boosting already strong bilateral relations with Sultan Qaboos, who undoubtedly trusts Rouhani more than he would any hardline Iranian president to improve the prospects for regional stability. Not surprisingly, Rouhani avoided Bahrain and Saudi Arabia during his “charm offensive”. As one of the most outspoken critics of Iran’s nuclear program, Riyadh remains anxious, despite the passage of the JCPOA, about Tehran’s regional ambitions. Although Rouhani has advocated for greater regional cooperation, Iran under his leadership has nonetheless actively armed militant groups abroad. It is clear that Tehran hopes to continue maintaining, and extending, its crescent of influence throughout the region. Additionally, its support for Yemen’s Houthi rebels and for Syria’s Ba’athist regime have hindered even minimal hope for an improvement in Riyadh and Tehran’s tense relationship. Even if Iran were to commit to rolling back its influence abroad, both Saudi Arabia and Bahrain have grown to rely on sectarianism to enhance their own political control. The Iranian revolution inspired Shi’ite nationals in both countries to protest before the ensuing crackdowns on Khomeini-fueled activism in the GCC. The “Arab Spring”, which Iran branded as an “Islamic Awakening”, sparked even more protests in Saudi Arabia and Bahrain, primarily among Shi’ites. Both governments accused Iran of orchestrating the protests, even though there was little evidence of Tehran’s involvement. It was critical, however, for justifying their harsh repression of protests, and for delegitimizing the demands of elements within their countries’ Shi’ite opposition. In Saudi Arabia, granting Shi’ites greater political rights would undermine the Kingdom’s own Islamic ideology, which categorizes them as “heretics”, and would open the floodgates for other Saudis to demand more reform that similarly could threaten the Al Saud family’s legitimacy. Sectarianism fuels Riyadh’s narrative as the sole protectorate of Islam, with Iran as its greatest enemy. Similarly, Bahrain’s ruling Al Khalifa fears that expanding political rights to its Shi’ite citizens—who make up the majority of the archipelago sheikdom’s population—will threaten their own monarchal rule. In a battle over competing and overlapping spheres of influence, rapprochement between Saudi Arabia and Iran would contradict both countries’ expansive foreign policy agendas. Unless they agree to reel in their regional ambitions, it is unlikely that even a reformist leader like Rouhani would be able to mend relations with the regional powerhouse. This severely inhibits his plans for bridging divides with the Gulf at large, considering Riyadh’s influence over the entire GCC. Qatar most recently is realizing the extent of the Kingdom’s power. Recent political developments have already undermined Rouhani’s efforts to improve relations with the Arab Gulf states during his second term. Donald Trump, on his first overseas trip to Riyadh as president, accused Iran of “fuel[ling] the fires of sectarian conflict and terror.” He further reaffirmed Washington’s commitment to work closely with Sunni Arab leaders in the fight against violent extremism. Trump’s unprecedented support for the GCC has emboldened them to take an even firmer stance against Iran. 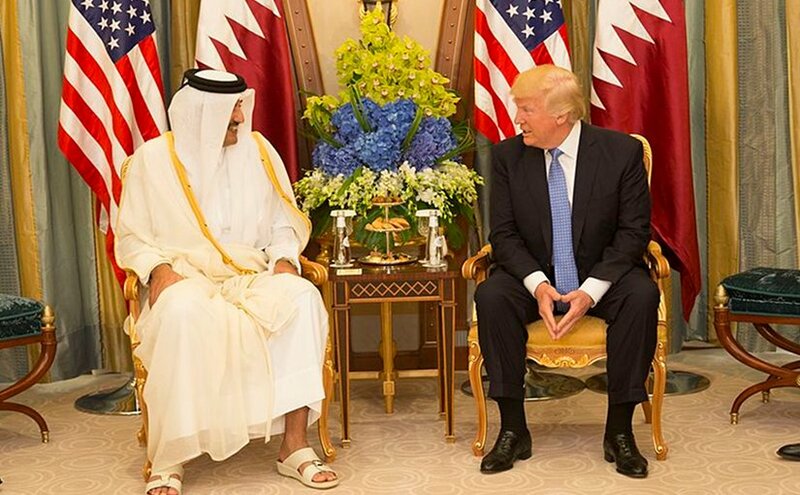 This newfound support by the U.S. has inspired three Arab Gulf states (Bahrain, Saudi Arabia, and the UAE) to sever ties with Qatar, which has grown closer to Iran under the Rouhani administration. Riyadh accused Doha of funding Iranian-backed militias in Iraq, Syria, and Yemen and recalled its diplomatic mission, closed its borders, and deported thousands of Qataris—as well as their camels. Bahrain and the UAE cut diplomatic ties with Qatar shortly after Saudi Arabia did, and were followed by other Arab and African states which expressed solidarity with Riyadh and Abu Dhabi, including Egypt, Libya’s Tobruk-based administration, Mauritania, Senegal, and Yemen’s internationally recognized and exiled government. The campaign against Qatar is retribution for Doha’s independent foreign policy that not only does not subscribe to Riyadh’s sectarian narrative, but also supports regional stability that requires the normalization of relations with Iran. Saudi Arabia hoped to send a powerful message not only to all Arab Gulf states, but also to others in the region that seek to work with the Islamic Republic. Unquestionably, the simmering Qatar crisis has granted Tehran an opportunity to take advantage of longstanding tensions between the GCC’s members and weaken Riyadh’s leverage over its fellow Arabian Peninsula states. Yet the extent to which Doha will be capable of counter-balancing the Saudi/UAE-led bloc’s actions against the emirate by moving closer to Iran’s geopolitical orbit remains to be seen. To further complicate Rouhani’s efforts in prioritizing Arab Gulf relations, on June 21 Riyadh announced that it had deposed Crown Prince Mohammed bin Nayef, and announced that Mohammed bin Salman (MBS) would take his place. As defense minister and Deputy Crown Prince, MBS was vocally opposed to any form of rapprochement with Iran. In a recent interview, he warned about Iran trying to seize Mecca and asserted that it would be impossible to negotiate with Iran for sectarian reasons. Like the diplomatic rift with Qatar, the succession shake-up is intended to signal to Tehran that its foreign policy efforts will be futile in the GCC. Does Rouhani’s Victory Matter in the GCC? The 2017 presidential elections were arguably one of the most important ones in the Islamic Republic’s history because they served multiple purposes. It was a mandate not only for the nuclear deal, but also for the reversal of Iranian isolationism. Rouhani ran in 2013 primarily on a platform of reviving the economy, and did so again this year. He understands that in order to develop his country’s economy, he will not only need to continue improving Iran’s relations with the West, but also its Gulf neighbors. Like his predecessor, he understands that improved ties with the GCC members will be pivotal for economic growth, which is why it will continue to be a priority in his foreign policy agenda in his second term. Khamenei is 77 years old, and this presidency may be the last one under his supreme leadership. Rouhani’s second presidential term will double as a trial-run for him to prove himself as a potential successor to Khamenei as supreme leader. As such, Rouhani would have an even stronger influence over foreign policy, especially over the Republican Guards who have been at the forefront of supporting Shi’ite militias abroad. Rouhani as Iran’s new supreme leader would advance the prospects of regional stability despite opposition from his hardline counterparts. As a reformist and pragmatist, he is more likely to make concessions on Iran’s regional ambitions, such as curbing the expansion of its sphere of influence in order to prove to the GCC that Tehran is seriously interested in rapprochement. Rouhani’s reelection is an opportunity for the Arab Gulf states, plus the entire international community, to improve relations with Iran following years of sanctions and to promote greater regional stability. GCC members, chiefly Saudi Arabia, should maximize the opportunity to work with the “Diplomatic Sheikh” before the end of his second term (or Khamenei’s death). Saudi Arabia’s peddling of sectarian rhetoric will only exacerbate regional instability, and cause its smaller Arab Gulf neighbors (especially Oman) to be even more disillusioned by its destructive foreign policy. Like Saudi Arabia, Iran, even under Rouhani, is responsible for much of the region’s woes. Rouhani will need to seriously restrain Iran’s behavior in the Middle East if he expects the King of Saudi Arabia to do the same. However, rapprochement is more likely to succeed under the favorable conditions set by Rouhani’s administration, as it is unlikely to resort to confrontation with GCC states during his presidency. His successor might be a different story. *Dina Yazdani is a reporter for Fair Observer, a strategic partner of Gulf State Analytics.